Now that Sun Media has revived the classic Cold War parlor game, Spot the Commie, it appears at least one candidate in Election 41 is playing along at home. Wally Daudrich is carrying the Conservative colours in Churchill, the northern Manitoba riding represented by New Democrat Niki Ashton. 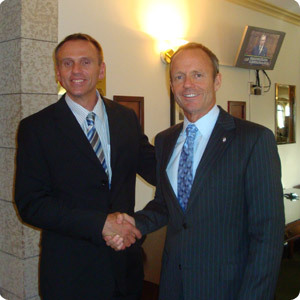 On his website, on a page titled, “What’s Wally Doing (sic),” he is seen shaking hands with then-Conservative International Trade Minister Stockwell day. Chinese educated Niki Ashton is a Socialist. She consistently berates industry and capital that would bring investment to our area. Niki would export our jobs to China if she had any power. Thankfully she is only Jack Laytons (sic) back bench complainer. Niki Ashton is a bench warmer. Niki Ashton has no relatives in Ottawa. Apparently, Daudrich is referring to Ashston’s studies at Li Po Chun United World College in Hong Kong. No Communist indoctrination centre, the school is part of a network of colleges around the world formed to improve international relations after the Second World War. We’re not sure what the “no relatives in Ottawa” line means, however. The line, “no relatives in Ottawa,” apparently refers to the fact Ashton’s father, Steve, is a cabinet minister in the Manitoba provincial government. Daudrich has also studied out-of-country. According to his bio, he worked toward a bachelor of theology degree at International Baptist College in Tempe, Arizona. If I was in Churchill I’d vote for the socialist communist as opposed to the capitalist communist. Besides for a tiny backbencher Niki Ashton is carrying well above her weight in letting the rest of Canada and in fact the world know about the pending closing of a productive mine, by a foreign conglomerate that received funding for the contemptuous Harper government. David Emerson, the former Tory trade minister, now works for China. So they can’t be that bad! So now the CPC is against trade & increased relations with PRC? Or is Wally on his own with this party platform? Because all I’ve been seeing from this gov’t & their pandering to G8/G20 is more free trade & increased liberalization of global markets & that actually DOES mean jobs going to China & anywhere else people will for much less than we would. Perhaps a B.Th. is not good prep for such matters.